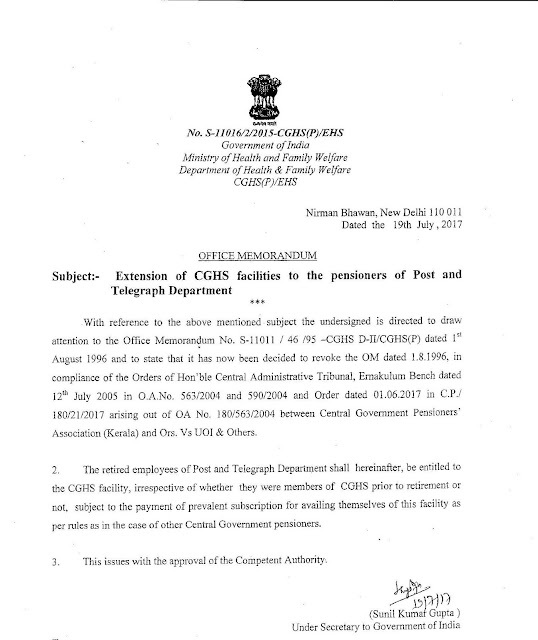 With reference to the above mentioned subject the undersigned to draw attention to the Office Memorandum No. S-11011/46/95 -CGHS D-II/CGHS(P) dated 1st August 1996 and to state that it has now been decided to revoke the OM dated 1.8.1996, in compliance of the orders of Hon’able Central Administrative Tribunal, Ernakulam Bench dated 12th July 2005 in O.A.No 563/2004 and 590/2004 and Order dated 01.06.2017 in C.P./180/21/2017 arising out of OA No. 180/563/2004 between Central Government Pensioners Association (Kerala) and Ors. Vs UOI & Others.